Robots and automation are omnipresent in horticulture nowadays. 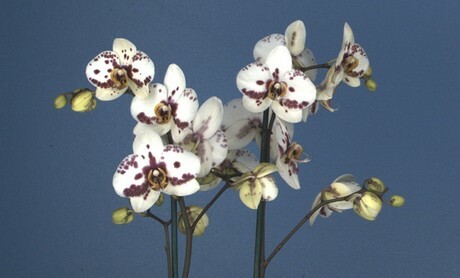 One example of this is counting the number of flowers and buds in phalaenopsis plants. Computers are able to do this much faster than humans - however, there's a catch. 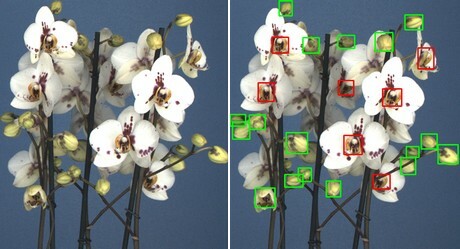 The number of open flowers during delivery of phalaenopsis plants keeps increasing, which is of course a good thing for the consumer, but computers may have problems seeing other flowers or buds obscured by open flowers. To solve this problem, Hans Izeboud of Aris turned to deep learning. Aris develops and installs robot and camera systems for assessment of plants and animals. They've got 1,000 systems up and running across the globe. "One of our most successful applications," Hans says, "is used for assessing phalaenopsis." Assessment takes place based on visual aspects: length and height, number of branches, buds and flowers, color and pattern of the flowers, etc. "More and more flowers are open during delivery of phalaenopsis. These flowers can overlap and obscure buds, making it increasingly difficult to be able to accurately count the number of flowers and buds. That's why we asked Fizyr to conduct a feasibility study to see if deep learning can help us with this." Fizyr was started in 2014 by Prof. Martijn Wisse as a Delft University of Technology spin off under the name ‘Delft Robotics’. The aim was, as a robotics integrator, to enable small and medium-sized enterprises to profit from robots. Fizyr develops software for robots to cope with any pile of unknown objects using machine vision. The company's deep learning trained algorithm identifies products, can perform a quality control and almost instantaneously creates a 6 DoF grasp pose. So how does it work? Herbert ten Have, CEO of Fizyr, explains: "We train our algorithms by teaching it with thousands of 2D or 3D images which represent the hard daily practice. The neural network ‘teaches itself’ and learns from all examples given. That’s the easy explanation. All the hard expert work is done by our brilliant team of multidiscipline engineers." Fizyr was a double winner of the Amazon Picking Challenge. This was a challenge to pick and stow a variety of products between a shelf and a bin. Besides the unstructured environment the main challenges are: 3D Vision, motion planning, grasping, task planning and robustness. And Herbert wants to capitalize on this success and the results achieved in 2017. "We focus on solving the challenges of global leading machine factories and system integrators", he says. "We often solve their first and primary question; can a deep learning algorithm be trained to cope with variation and robust enough to provide the required answers? We mostly start with a small and quick PoC (Proof of Concept) to provide those answers. Getting those results and seeing clients impressed and enthusiastic is always a great pleasure for our team in Delft." So how can this technology help the horticulture business? "Fizyr can help automate processes in horticulture that were impossible to automate until recently, due to the lack of computers coping with variation", Herbert says. "Our deep learning algorithm adds a layer of understanding, bringing autonomous decision making to processes that involve identifying, quality control, counting, picking and manipulating." At Fizyr, they've done projects for three multinationals in the horticulture industry recently. And then there's the matter of the orchids: Herbert says that the first version was already more accurate than humans, and they're currently working on making it suitable for all types and colors of orchids. Hans Izeboud confirms that the first results of the project Fizyr conducted for Aris are looking good. "We believe in deep learning for the assessment of natural products, and are very happy about our cooperation with Fizyr", he says.